This is one of my husband’s favourite chutney’s and he just cannot stop sprinkling it over everything and anything! I had never tasted it (forget even making it) before I got married and had only heard about it from him(my MIL apparently would always have a batch of it in the house). My family used more of coconut(milk/paste,etc) for our cooking as we are originally from a small coastal town in South India (Mangalore to be specific, for those who are familiar with India and Indian towns), whereas my hubby’s family is more familiar to using peanuts in their cooking. 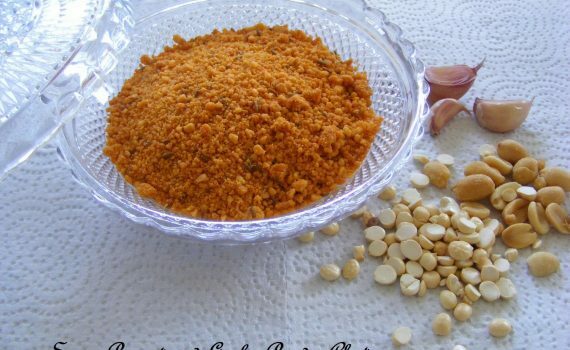 and use a handful of roasted bengal gram dal(roasted and puffed split chickpeas) which not only adds to the taste but also absorbs the oil from the peanuts (and the moisture from the raw garlic) and hence the result is a “powder”chutney and not a “pasty” chutney! Over the years,I’ve not only perfected the art of making this chutney powder,but also added my own “healthy” ingredient-flaxseeds! Powder all the ingredients together to get a coarse chutney. Transfer to an air-tight container and store in the fridge(should keep for about 2 weeks or maybe even more). You can use it as a chutney or sprinkle a little on noodles/fried rice/salads or mix it with a little yogurt and use as a dip or as a filling inside sandwiches.